The best way to understand where you are is to look at your value stream. 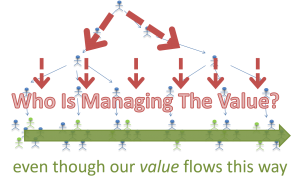 The value stream can be thought of as the flow of work that takes an idea to the point of realization of value. Notice that what is most important is the realization of value because merely delivering product is of no value by itself. You must attend to the total time from start until your organization or your customers realize value from your efforts. 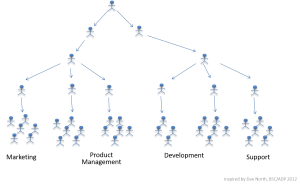 Most organizations exhibit some form of hierarchy. In this type of structure, it is natural for managers to consider if their people are properly utilized, being product, doing quality work and are working on the right things. However, realizing value does not occur in a silo. 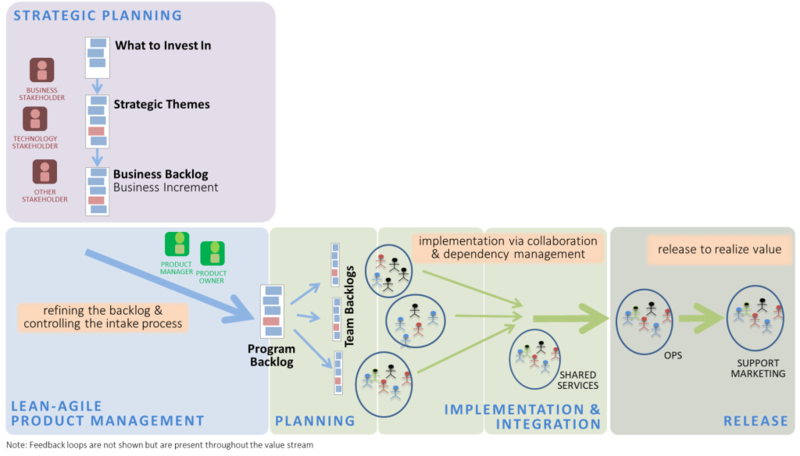 Our work typically goes across an organization as shown in Figure 2. In Figure 2, the red arrows are the actions of getting approval. Note that these actions in and of themselves add no value. Also, a real value stream would not be such a nice flow from left to right but would go forwards and backwards. When you look at the total time from start to realization of value, you begin to see the need to attend to time-to-market, your ecosystem, visibility, effects of upstream groups on a team, and the effects of a team on downstream groups. 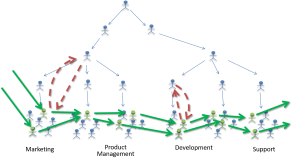 The value stream is where the work actually takes place, as illustrated in Figure 3. By comparing Figures 2 and 3, you can see that natural conflict that arises: it is common to manage work in one way but it actually flows a different way. This is illustrated in Figure 4. When you understand this conflict, you can do something to resolve it. Transformation begins with understanding the value stream: the work people are doing. We illustrate the work people do in a flow diagram because the intent is to go from selection to realization quickly. Note that these are shown linearly but in fact they are done interactively and with continuous feedback. This example also does not include what heavily regulated companies (such as health equipment makers and insurance companies) or companies with hardware and software components. Lean Thinking helps attend to these additional factors. Be clear that we are not suggesting that there should be a flow from left to right. There is both heavy interaction and feedback required. We have not shown this in order to keep the diagram easier to understand. That fact that the above is a common flow of software may not be surprising. Perhaps what is, however, is that 80% of organizations attempting Agile methods have pretty much the same problems. It is important to realize that most companies are organized the same way. Systems-thinking tells us that the ecosystem of a company will dictate many of the challenges it experiences. Understanding these challenges is an important start in seeing how they can be properly addressed. Value stream mapping is the best way to learn what is being done in your organization. We have seen many people in the same organization have different understandings of what is going on. A value stream map enables everyone to get on the same page. A general sense of an organization’s workflow is critical to see what is happening. Delays cause much of the work that people have to do. The value stream is often the best way to see these delays. By attending to the value stream and the challenges that occur, you can see where to put your attention for improvement. It is important that SAFe has subtly redefined the value stream that may cause confusion. See The Value Stream in SAFe for more information.